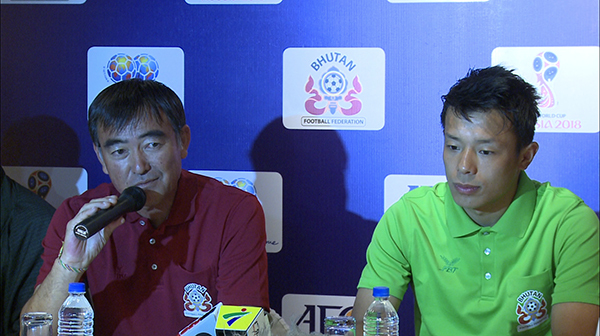 The National Football Coach of Bhutan, Tsukitate Norio says the National Football Team will give their best. Interacting with BBS after arriving from Hong Kong earlier, the Dragon Boys had said they will do their best to end the game on a draw. At a press conference held today, Coach Tsukitate Norio turned down most questions saying tomorrow’s match will speak for itself. He however said China is a strong team in Asia, and the Dragon Boys will give their best. The Captain, Karma Shedrup Tshering said tomorrow’s results cannot be predicted. But, what is certain is that Bhutan’s nil against Hong Kong’s seven has not dampened the hopes of the players. The Dragon Boys are practising rigorously to give their best at the Changlimithang Stadium tomorrow.